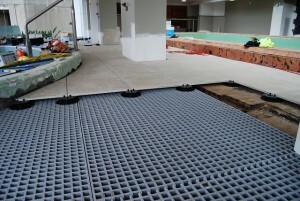 HDG Fiber-Reinforced Plastic Molded Grating can provide a low cost alternative where subfloor access and unobstructed air flow is required. Lightweight 2’x 2′ Micro-Mesh panels are easily removed, providing ready access to electrical conduits, air supply plenums, and service lines. Fibermesh grating can also be mechanically fastened to the tops of the Buzon pedestals.